Home B: Community What To Do: Chadds Ford Plein Air Event, Sat. Also: Chocolate lovers rejoice, Celtic Fest and more! Usually, winter weather in this area is not very conducive for outdoor events — except maybe activities for skiers, skaters, snowboarders and people who enjoy really cold outdoor temperatures. On February 6, the Chadds Ford Historical Society will host its Eighth Annual Winter Plein Air Event at its Barn Visitors Center (1736 Creek Road, Chadds Ford, 610-388-7376, www.chaddsfordhistory.org). This weekend, a select group of 22 artists will be creating works of art “en plein air.” After a session of painting in Chadds Ford and the Brandywine Valley, the participating artists will return to the Chadds Ford Historical Society’s Barn Visitor Center to frame and hang their paintings for a special exhibit and art sale. Visitors are invited to attend the exclusive “En Plein Air Preview Party” on Saturday from 5-6 p.m. for a first look at the wet paintings while enjoying wine and hors d’oeuvres with the artists. All the artwork on display will be available for purchase. Preview tickets, which admit two people, are $50 — $25 of which can be applied to an art purchase. Following the preview, there will be a wine-and-cheese reception from 6-8 p.m. which features the regular admission price of $10. 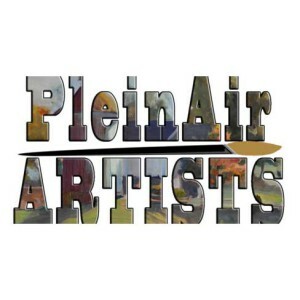 The roster of artists in the 2015 winter “en plein air” event features Bruno Baran, Jane Ramsey, Stewart White, Lynn Mehta, Jacalyn Beam, Roberta Staat, Jackie Clark, Chuck Law, Desiree Holmes Scherini, Ann Crostic, Erin Gill, Randall Graham and Neal Hughes. The list also includes Monque Kendikian-Sarkessian, Jeanne Kirby, Barry Koplowitz, Courtney Lee, Alison Menke, Elise Phillips, Alison Menke, Elise Phillips, Jim Rehak, John Slivjak, Anne Snyder and Tara Will. Laurie Hull, who is the director and founding member of Tri County Paranormal will discuss paranormal investigations of the Paoli Battlefield as part of a lecture program at the General Warren Inne. 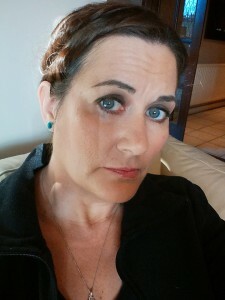 On February 8, Laurie Hull, who is the director and founding member of Tri County Paranormal, will discuss her results of two paranormal investigations of the Paoli Battlefield that took place last year. These tours showed that there was paranormal activity all around the battlefield. 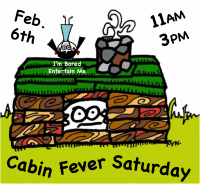 On February 6, Historic Sugartown (690 Sugartown Road, Malvern, 610-640-2667, http://www.historicsugartown.org) will present a special event called “Cabin Fever Saturday” from 11 a.m.-3 p.m. The event will have an array of family-friendly crafts and old-fashioned games along with demonstrations by Historic Sugartown, Colonial Pennsylvania Plantation, East Goshen Historical Commission and the Wharton Esherick Museum. Featured activities include making paper using historic methods, creating Victorian Valentine Cards, making and playing with 19th century paper dolls, playing with early American toys and games, old-time activities with the East Goshen Historical Commission and touring Historic Sugartown’s General Store and Carriage Museum. “Cabin Fever Saturday” will also include complimentary coffee and hot cocoa. Admission is $5 for adults and $3 for children (ages 3-17). Children (ages 2 and younger) are admitted free and there is free parking. 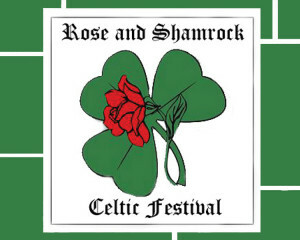 The Third Annual Rose & Shamrock Celtic Festival, which showcases Irish and Scottish music, dance, and workshops, will be held February 6 at the Ware Center’s Atrium (42 North Prince Street, Lancaster, http://www.artsmu.com). The festival, which runs from 12:30 to 8:30 p.m., includes a lineup of six Celtic bands — Belfast Connection, Charlie Zahm & Tad Marks, Fire in the Glen, Seasons, Down by the Glenside and Dublin 5. There will also be a performance by the Hooley School of Irish Dance. Tickets are $35 for adults, $32 for seniors and $15 for students 20 and younger. Food will be available for purchase on-site. If you’re in the Lancaster area on February 6 for the Celtic Festival and you really want to keep your international vibe going, you could also catch a live performance by Flor de Toloache at 6 p.m. at Millersville University’s Winter Visual & Performing Arts Center (60 W Cottage Ave, Millersville, http://www.artsmu.com). Founded in 2008, Mariachi Flor de Toloache is New York City’s first and only All-Female Mariachi band. The 12-member band features all of the traditional instruments essential in Mariachi — violins, trumpets, guitar, guitarrón (acoustic bass) and vihuela, as well as some surprising elements such as flute and cajón (percussion). The concert lasts 60 minutes with no intermission and admission is free. One of the best things about February is Valentine’s Day and one of the best things about Valentine’s Day is chocolate. Valentine’s Day won’t be here until next weekend but that won’t keep chocoholics from celebrating early. Hershey is planning a month-long celebration of all things chocolate. This weekend, visitors to the Hershey Store can try their hand at making their own heart-shaped milk chocolate confections and hand-made truffles. On February 5, there will be a “Chocolate Dinner Extraordinaire” at the Hotel Hershey and a “The Great Hot Cocoa Challenge” at the Hershey Lodge. Other activities throughout the month include “Chef Demonstrations” at the Hotel Hershey, “Hershey’s Chocolate Dessert Journey” at Hershey’s Chocolate World, “Chocolate and Spirits Pairing Class and Chef Demonstrations” at the Hershey Lodge and “Chocolate Tea” at the Hotel Hershey. The list of special events also includes “Hershey’s Character Breakfast” at Hershey Lodge, “Wild Treats” at ZooAmerica, “Old Chocolate Balsamic Tastings” at the Hotel Hershey, and “Hershey’s Hot Chocolate Pajama Party” at Hershey Lodge. Video link for “Chocolate-Covered February in Hershey” — https://youtu.be/bRxnlz9IJvI. Chocolate is also featured during “Wine and Chocolate Month” sponsored by the Brandywine Valley Wine Trail (www.bvwinetrail.com). The BVWT is inviting patrons to bring their sweethearts and celebrate with the wineries as they present delicious wine and chocolate tastings and other romantic events throughout February. Themed events will be held at Kreuz Creek Vineyards (553 South Guernsey Road, West Grove, 610-869-4412, info@kreutzcreekvineyards.com) on February 13 and 14, Paradocx Vineyard (1833 Flint Hill Rd., Landenberg, 610-255-5684, www.paradocx.com) from February 8-12 and Black Walnut Winery (3000 Lincoln Highway, Sadsburyville, 610-857-5566, www.blackwalnutwinery.com) from February 6-28. 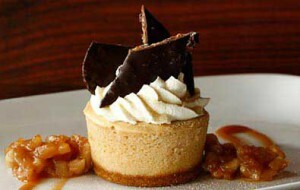 The Brandywine Artisan Wine Trail (http://www.brandywineartisanwinetrail.com) will also celebrate chocolate, wines and Valentines throughout the month as part of its month-long “Art of the Valentine” event. Participating wineries are Flickerwood Wine Cellars (116 W. State St., Kennett Square), Galer Estate Vineyard & Winery (700 Folly Hill Rd., Kennett Square), Grace Winery (50 Sweetwater Road, Glen Mills), Kreutz Creek Vineyard Tasting Room (44 East Gay Street, West Chester), Paradocx Vineyard (879 East Baltimore Pike, Kennett Square), Penns Woods Winery(124 Beaver Valley Road, Chadds Ford), Ten Gallon Hat Winery (455 Old Baltimore Pike, Chadds Ford) and Wilson Vineyard (4374 Forge Road, Nottingham). 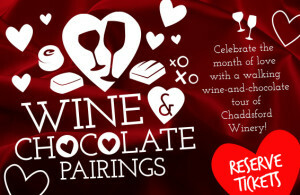 Additionally, the Chaddsford Winery (632 Baltimore Pike, Chadds Ford, 610-388-6221, www.chaddsford.com) will offer “Wine & Chocolate Pairings” from February 6-28. Participants will be able to explore several areas of the historic property visit six stations that feature a different pairing of John & Kira’s gourmet chocolate with the winery’s award-winning wine. According to the Chinese Zodiac, 2016 is the “Year of the Monkey” — actually, the “Year of the Red Fire Monkey.” 2016 is the 4713th Chinese Year and the first day of Red Monkey is on February 4, 2016. People born in the “Year of the Monkey” are generally believed to be smart, clever and intelligent, especially in their career and wealth. They are lively, flexible, quick-witted and versatile. On February 5, there will be a special event in Philadelphia to welcome in the “Year of the Monkey” when International House Philadelphia (3701 Walnut Street, Philadelphia, 215-387-5125, http://ihousephilly.org) hosts its 14th Annual Lunar New Year Celebration. Tickets are $12 for adults and $5 for children (under 12). Another interesting stage presentation in Philadelphia this weekend will be the Philadelphia Theatre Company’s production of the intense and timely play “Exit Strategy” by “Chicagoan of the Year” Ike Holter. The show will run through February 28 at the Philadelphia Theatre Company’s Suzanne Roberts Theatre (480 South Broad Street, Philadelphia, 215-985-0420, PhiladelphiaTheatreCompany.org). Directed by Kip Fagan, the production features an ensemble cast with Michael Cullen, Aimé Donna Kelly, Rey Lucas, Deidre Madigan, Christina Nieves, Brandon Pierce, and Ray Spahn. “Exit Strategy” tells the story of the heartbreaking final days of a condemned Chicago public school — a school that was physically falling apart and heading to its demolition day that was arranged by City Hall. “I started writing the play in late 2013 and it premiered at the Jackalope Theatre in Chicago in 2014,” said Holter, during a recent phone interview when the play was in rehearsal stage in Philadelphia. “One of the inspirations for writing this play was that I really like shows that represent Chicago –that bring the culture of Chicago to the stage plays. I wanted to do a Chicago story about people hanging on and people letting go. I had a lot of friends who were teachers and I’m also a teacher. The variety of opinions and points of view played a major role in Holter’s approach to the story. “I knew I wanted to view the situation from a lot of different eyes — teachers and administration,” said Holter. “Spiritually, I wanted to have as many eyes as possible. I wanted to get a nice mix of voices. “The first draft took a few weeks. Plays are an ongoing thing. I come to rehearsal every day and change little things. My role is to give actors time to get comfortable. The show runs 90 minutes without an intermission. Most shows van be 90 minutes and I didn’t think an intermission would help. The show that is heading to Off-Broadway is “Exit Strategy.” The gripping drama will run March 30 through May 6 at Primary Stages at the Cherry Lane Theatre. Opening night is scheduled for April 12. Philadelphia Theatre Company’s production will run evenings from Tuesday through Saturday along with matinees on Saturdays and Sundays. Ticket prices range from $24-$62. If you’re looking for indoor activities– especially if you have kids with cabin fever — there are two good options in nearby northern Delaware. The “Main Arena” features a grid or trampolines and two tumble tracks. The “Dodgeball Arena” takes the classic game of dodgeball to a whole new level — including fiercely-contested dodgeball tournaments. Rates for the trampoline areas are $11 for 30 minutes, $15 for 60 minutes, $19 for 90 minutes and $23 for 120 minutes.“Speed Wall,” “Mechanical Bull” and “Velcro Wall” each require one ticket. One ticket is $2 and a three-ticket option is available for $5. The Delaware Museum of Natural History (4840 Kennett Pike, Wilmington, Delaware, 302-658-9111, http://www.delmnh.org) has a new attraction. “Great Balls of Fire: Comets, Asteroids, Meteors” opened on January 30 and will run through May 30. “Great Balls of Fire: Comets, Asteroids, Meteors” shares recent discoveries and cutting-edge planetary science with a variety of interactive, multimedia experiences — ranging from computer-based activities to a larger scale “pod” where visitors can play the role of explorers-in-training. Comets and asteroids, which are the leftovers of the formation of the planets in our solar system, reside in a few distinct regions of the Solar System. The regions that are home to comets are much further away from Earth (and the Sun) than the region in which asteroids are located. Because asteroids are relatively close to Earth, they are made up of the same compositional elements as our planet. The composition of comets includes ices that warm up upon approaching the Sun, causing out-gassing that often generates highly visible tails. Meteoroids are small pieces of asteroids or comets that either burn up in the atmosphere or, as meteorites, strike the surface of the planet. These generally do very little damage. Comets and asteroids pose a danger of colliding with planets, moons or each other only on very rare occasions, but with potentially devastating consequences. Visitors to “Great Balls of Fire: Comets, Asteroids, Meteors” will be able to climb into a “spaceship” and blast off to the asteroid belt and Jupiter on a mission to gather data about asteroids and comets; operate a blink comparator device to understand one of the tools astronomers use to find “Near Earth Objects”; learn how scientists use light curves to determine the shape and movement of asteroids; and save Earth and learn about gravity by trying to divert a “rubble pile” asteroid from impacting our planet. Other available activities include seeing what would happen if a comet or asteroid hit your town, shooting a projectile into a water tank and using a Spin Browser device to manipulate high speed video of the impact, examining a collection of rocks and using tests (magnetism, color, density) to determine which is a meteorite, watching clips from Hollywood movies such as “Empire Strikes Back” and building a solar system using a 42-inch touch-table display. Admission to the museum is $9 for adults, $7 for children (ages 3-17), $8 for seniors (age 60 and older) and free for children (under three). This weekend’s themed presentation is “Lunar New Year” from 11 a.m.-3 p.m. on February 6 and 7. The event will feature the traditional sights and sounds of China’s Lunar New Year celebration. The activity for February 13 and 14 will be “A Frosty Weekend” while “Africa” will be the theme for February 20 and 21and “Ireland” will be the theme for February 27 and 28. As a special attraction, the museum will host “The Frosty Ball” on February 12. Admission to the museum is $13.95 for adults and children (12 months and over) and $12.95 for seniors. Children visiting the Museum must be accompanied by an adult 18 or older. You still have time to visit the 2016 Philadelphia International Auto Show which opened on January 30 and is running through February 7 at the Pennsylvania Convention Center (1101 Arch Street, Philadelphia, 610 279-5229, www.phillyautoshow.com). The Philly Auto Show is a huge show with more than 700 vehicles on display under one roof. This year’s 115th annual staging of the event features a 700,000 square foot display floor with a wide array of pre-production, production, exotic, classic, and concept cars. The 2016 show hours are noon-10 p.m. on February 6, 9 a.m.-10 p.m. on February 7 and 9 a.m.-8 p.m. on February 8. Tickets are $14 for adults (age 13 and up) and $7 for children (ages 7-12). Children age 6 and younger do not require a ticket. Longwood Gardens (Route 1, Kennett Square, 610-388-1000, www.longwoodgardens.org) is hosting its popular “Orchid Extravaganza” through March 27. Approximately 5,000 colorful orchids hang from baskets, create inspiring arrangements and adorn unique forms throughout “Orchid Extravaganza.” Two of the most interesting exhibits are an oncidium waterfall display and an orchid meadow. Finally, if you’re looking for something to do on Sunday, you could watch a pro football game on television. It will be the last one for awhile.